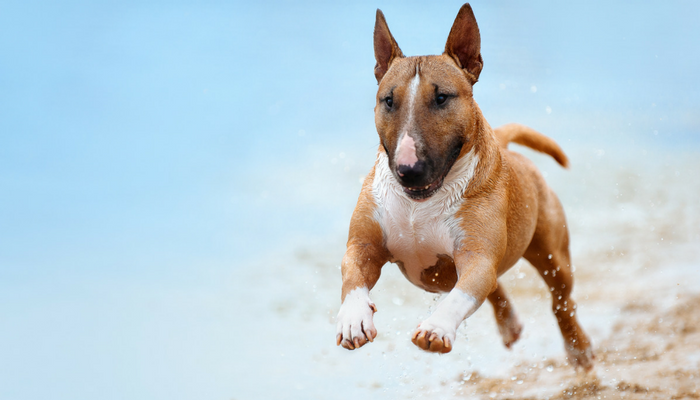 Does your dog have a lot of energy? Is your dog hyper? Struggling to find ways to exercise your dog? You are not alone. When Laika was younger I struggled to keep up with her. Our daily walk didn’t even come close to tiring her out; if anything it hyped her up more. She made it quite clear to me that a 2 hour walk wasn’t going to cut it. She needed a lot more exercise. So I started experimenting with different doggie exercises, trying to figure out which ones came close to tiring her out; luckily I found a few. 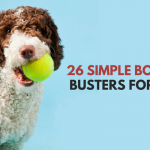 These activities will give your dog a lot of physical exercise in a short amount of time. Here’s 5 quick ways to tire out your dog. Flirt poles utilize your dogs instinct to chase in a non destructive manner. And for those of us who have a hard time keeping up with our dogs it’s great because it’s an activity where your dog does all the work. Your dog will be running around like crazy while you stand there moving the lure around for them. A couple minutes of this are extremely tiring for your dog. When first starting out keep the sessions short to avoid injury since this is a high impact activity. You can make your own flirt pole with some pvc pipe, some bungee cord and a dog toy. There also available at many pet stores, and there’s plenty available on amazon. Frisbee is like fetch on steroids, or really what fetch could be like if I could throw worth a darn. I can toss a frisbee way further than a ball, and that added running distance for dogs is great physical exercise. It doesn’t get much easier that standing there tossing a frisbee while your dog does all the hard work. If your dog doesn’t know how to catch a frisbee I’d start out by using one that’s a soft disc. 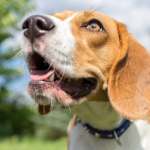 Traditional frisbees are pretty hard, so if your dog accidentally gets hit in the face with one it may discourage them from trying to catch it. Get your dog excited about the frisbee by tossing it short distances or rolling it on the ground and encouraging them anytime they show interest in it. Tug is my favorite game to play with my dog Laika. It’s fun, it’s great physical exercise, and it’s a good way for dogs to practice good manners. When playing tug just remember to follow one rule: the game stops if your dog’s teeth touch your skin. Puppies who haven’t learned bite inhibition will struggle with this rule. If you want to save your hands from those sharp teeth remember to teach your puppy not to bite before attempting tug. 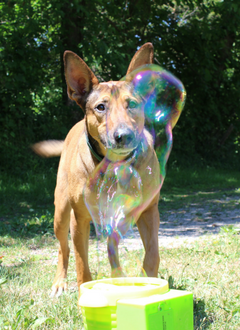 One of the easiest ways to tire out your dog is to teach them to chase bubbles. It still surprises me how much Laika enjoys it, and if I had to guess I’d say it’s probably Laika’s all time favorite game (if she could talk I could confirm this). As soon as I start walking over to the kitchen sink where those bubbles are she starts to get excited. If your dog doesn’t know how to chase bubbles start by blowing a couple at a time. Point to the bubbles and encourage your dog to chase them around. Catch some yourself to show you dog that there’s nothing to worry about, and that the whole point of the game is to get them before they touch the ground. We use bubbles made for kids, but there’s plenty of bubbles made for dogs on amazon (bacon scented is the most popular choice). They’re non toxic, but they can upset your dogs stomach if they ingest too much. And because bubbles can be irritating to your dogs eyes remember to wipe off their face afterwards. If your dog doesn’t mind the water using the hose (or sprinklers) can be a great way to give them exercise. I found this out by accident the first time I tried to bathe Laika outdoors after she rolled in something gross. Rather than standing still for her bath she went crazy trying to chase the stream of water. Some dogs love chasing (or in Laika’s case biting) water that’s coming out of a hose or sprinkler. She’d run back and forth chasing the hose hours if I let her, and it’s one of those activities where your dog (or water bill) is doing all the work. A good balance of mental & physical activity can keep dogs busy & entertained. 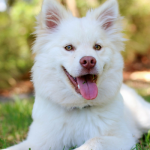 A lot of your dog’s physical demands and need for mental stimulation will depend on his breed and age. Laika (being a German Shepherd mix) needs plenty of both mental & physical activity, so I added in a new play and exercise sessions each day until I found the routine that worked for her. You’ll know you’ve found the right balance when your hyper dog starts to relax throughout the day. If you’re giving your dog plenty of physical exercise and they’re still hyped up try adding in some mentally stimulating activities. Playing some fun games with your dog and using food puzzles are two of my favorites. Stuffing a Kong with frozen peanut butter might seem too simple, but it’s an easy way to keep dogs entertained for 30+ minutes. 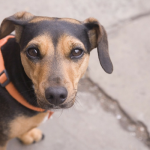 Is a walk good enough for your dog? Does your dog get a mix of mental & physical exercise? What are your favorite ways to exercise your dog? This post contains affiliate links, if you make a purchase I’ll earn a commission. Please see our disclosure page for more information. « Why Do Dogs Snore? a weighted backpack and a short walk work here in a pinch too. Great ideas! Thanks, I didn’t even think of that. You’re so right, a weighted backpack does such a great job. Great article! I, for one, experience some difficulties with my dog ever since I’ve made him a new home with basically everything that he needs in one small, elegant home. Kinda spoiled him and I can see myself applying all these rules ever since my dog started putting weight. Walks, and tug of war/chasing the toy is how we do it here, so that flirt pole sounds like a great idea for one of mine. I’ll have to get one for him. I play tug of war with Remy and I still need to get him a backpack. I also think he would go nuts over bubbles. Have not tried that yet! Thank you for linking to my post too. My 11-month-old pup loves all the above, except the flirt pole. I haven’t tried that but now I will. Thanks for sharing that idea. His favorite changes periodically. Right now it’s bubbles, loves them and will chase them until I’m worn out. My go-to for my extremely active German Shorthaired Pointer is to harness him up, slap on a pair of roller blades, and let him run wild. He gets about 4 miles of daily running time which doesn’t tire him completely (15 minutes after getting home he’s already bringing me his ball so I can toss it around the house) but it definitely helps. It took much too long for me to figure out that you weren’t putting roller blades on your dog. My velcro GSD is too underfoot for me to be on wheels, but maybe one day! I need to try that Flirt Pole for my Toy Rat Terrier, she’s got tons of energy! She loves to play fetch and will go all day…I bought her an iFetch machine to save my arm from wearing out. She loves it and I taught her how to drop the ball into it so she can play by herself. =) She also has a small dog treadmill that she runs on. I wish I had 1/2 of her energy! Thanks for the great tips! Frisbee is our most played with my dog. While i throw the frisbee i do my jogging also so it is owner and dog exercise. My boy is my Service Dog so he gets a great deal of mental work which is wonderful but he always has energy to burn off. With that said we bought a treadmill and after I use it he uses it. I never leave his side while he is on it and I placed a baby gate to one side so he can not step off. Having this option has made life so much easier. He loves to swim, play with his friends at the dog beach and score his friends when they retrieve tennis balls. He refuses to chase them and bring them back. He loves bubbles and playing in the sprinklers! my puppy is 47 days old. He is too naughty that he disturbs me throughout the night and never allows me to sleep well for at least 5 hours. Please tell me some idea to make my puppy tired and there are many ideas in google but don’t work with it as it is only 47days old. Your puppy is still a baby. Most wouldn’t even have left their mamas at that age. Unless you are allowing him to use his kennel as a potty, he will need tending to during the night for a while just as a human baby does. He isn’t being naughty, He’s just very young. I’ve got a pup that gets super destructive if he’s got too much energy and I’m not home to play with him. I bought an automatic lazer pointer (originally meant for my cat aha!) and it’s been amazing, he would chase it until he passes out if I let him.